WITH so much to sort out when it comes to legal issues, it can be difficult to work out what applies to your situation. We spoke to Scorpion Legal Protection to find out the differences between a criminal case and a civil case. Criminal cases deal with offences against the state, or society as a whole. So even though one person might murder another person, murder itself is viewed as an offence to everyone in society, because it goes against public codes of behaviour and the laws that govern these. In criminal cases, the government prosecutes individuals for violating these laws (for committing a crime) and sets a punishment. Civil cases don’t involve criminal law. They usually address a dispute between two people, or a person and an organisation, to seek redress for a private wrong. A civil case usually begins when one person or business (the “plaintiff”) claims to have been harmed by the actions of another person or business (the “defendant”) and asks the court for relief by filing a “claim” and instituting a court case. The aim is usually to get damages – money as compensation for any harm suffered – but you can also begin a civil case to get an interdict or other orders. 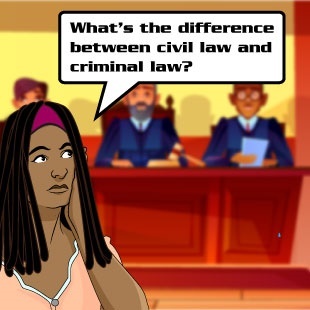 The difference between civil law and criminal law is that in criminal law the matter is always between the individual and the state, whereas civil law is between individuals or between an individual and organisation.